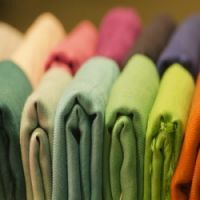 You may have encountered more than one different kind of Pantone Textile colour references, TC, TCX, TP, TPX and now TPG! This can obviously be a little confusing, so here's the low down. It's simple really, Pantone textile colour charts can be printed on either cotton or paper, and when printed on two such different substrates visual differences can occur. In other words, the colours can look different on cotton to paper. So, to indicate and highlight any potential difference, Pantone add a suffix to the textile colour reference, TCX for colours printed on cotton and TPG when on paper. Here is an example of the cotton and paper reference for the same colour, on cotton "13-0947 TCX" or on paper "13-0947 TPG". In 2013 Pantone extended the textile colour range to include more colours. At that time the existing colour numbers stayed the same, but an "X" was added to the TC and TP colour suffix to denote the "eXtended" range. Now (2016) Pantone have added another 210 new colours to the range, briging the number of colours now featured in the Pantone Fashion, Home + Interiors library to 2,310. The new edition paper colours have also been created from new eco-friendly formulations and a revised paper colour number TPG suffix adopted (Textile Paper Green). The colorant combinations have been modified to remove all lead pigments and chromium, while maintaining the same colour integrity as the previous versions that featured the TPX suffix. Reformulating the colours in this product to make them more eco-friendly has allowed Pantone to meet compliance standards in Europe and other countries Worldwide. So in short, the latest, most up-to-date and current Pantone Fashion,Home + Interiors textile colour references now end, TCX (Textile Cotton eXtended) and TPG (Textile Paper Green). I hope this helps you to understand what can be a somewhat confusing array of extensions to this Pantone colour library. When specifying your colour choices to a client or manufacturer, be sure to specify which guide version you are using, cotton or paper and, if possible, reference both. View the full Pantone Fashion,Home + Interiors range.